First of all, there have been some big changes over the past week. I have officially decided to change my name from Hood Photography to Sarah Bettey Photography. There were quite a few reasons for the switch, but the main one is that I have long been in a new chapter of my photographic life. I chose the name Hood Photography to represent me back when I had practically no experience. I hastily chose a name that covered my main location of photography, which was up on Mt. Hood where I had lived my whole life up until that point. But I was only in my early 20's then and a lot has changed since that time. I feel using my own name as my "brand" better shows what I do now. 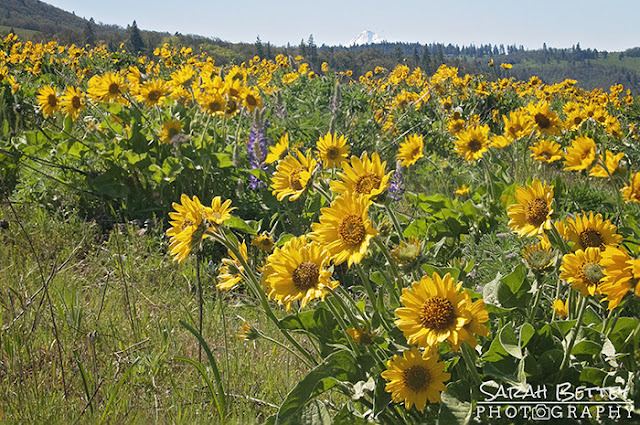 Sarah Bettey Photography reflects my true photographic passion, one that emphasizes my own goals of constantly gathering more knowledge of the craft. I use the outdoor adventures I take with my 4 year old son, family and friends as a backdrop for my photo opportunities. My photography is a direct result personal life experiences I have with those closest to me when I am capturing those images. Our first adventure under the new moniker was to Rowena Plateau. The balsamroot and lupine are in bloom, and the blue skies above provided a warm, inviting environment for us to spend some time on Sunday. Our old friend Mt. Hood peaked at us over the hills in the distance beyond the throngs of wildflowers. Hello, Sarah! Lovely capture of the beautiful flowers.Happy Tuesday, enjoy your day! Love the reasoning for the changes you've made. The photos are still just as spectacular! Thanks for sharing your beautiful outdoor post on this week's Maple Hill Hop! Continued success! Lovely shot of sunflowers Sara, have a great week. Wishing you luck here and hoping to see you again in our meme. Lovely flowers! Good for you for recognizing a new level of your experience in photography. Love your new look Sarah. Such a pretty shot, it is so cheerful.